Around 1840, Richard Gwyn left Jonesville to settle on the north side of the Yadkin River, recognizing the value of the forested hills and water power of the Big Elkin Creek. Within a decade, he and his family, established Elkin Manufacturing Company, a cotton mill which continued to operate during the Civil War, producing fabric for confederate uniforms. Elkin’s lovely historic district homes and downtown also survived the Civil War. Further up Big Elkin Creek, Alexander Chatham and Thomas Lenoir Gwyn opened a woolen mill in 1877 that grew and became Elkin's largest industry. The Hanes and Chatham families worked in tandem in the textile industry here before branching into Winston-Salem. The Northwestern North Carolina Railroad arrived in 1890, and Elkin was poised to take the opportunities the railroad brought for expansion. Elkin's history includes the Revolutionary War and the Civil War, the Second Industrial Revolution, and the Elkin and Alleghany Railroad. Listed on the National Registry of Historic Places, Elkin has embraced its history and added a touch of sophistication. The Yadkin River flows right along the historic district, and the beauty of the rolling countryside leaves one wondering what is around the next corner. 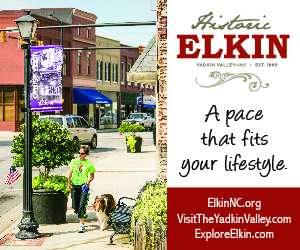 Visitors can walk our historic trails, shop in one-of-a-kind specialty stores, experience fine dining, paddle the Yadkin River, and enjoy an exhibit at the Foothills Arts Council. Elkin is located within twenty minutes of twenty wine tasting rooms (33+ in the region! ), all within North Carolina's first federally recognized American Viticulture Area - the Yadkin Valley AVA. The wine culture and ambiance, from summer music concerts, harvest festivals and novice blending trials, is the backbone to Elkin’s social atmosphere. For those wanting a faster pace on occasion, and national chain shopping choices, Winston-Salem is just 40 minutes away along Hwy 421 East. Elkin Municipal Park is a 25-acre Park with eight lighted tennis courts, a mile long scenic walking track (linking to other trails), a playground, two picnic shelters and a band shell, as well as an outdoor swimming pool that is open to the public during the summer months. Crater Park hosts a Yakin River Access public boat ramp, walking trail and camping for paddlers. Overmountain Victory National Historic Trail (OVT)- Elkin is the eastern trailhead for the OVT, one of only 15 such trails in the nation. This trail commemorates the journey of the "Overmountain Men" who traveled from Tennessee, Virginia and North Carolina, and fought and defeated the British at the Battle of Kings Mountain. The Wilkes/Surry Patriot Militia mustered in present day Municipal Park on September 7, 1780. Yadkin River Trail - Paddling, fishing and bird watching can all be enjoyed on this section of the 165 mile river trail, rich in natural beauty and American history. Access the river at the boat ramp at Crater Park. Leaf-to-Vine Scenic Byway - 65 miles of farmland, foothills and mountains with interpretive sites tell the story of how the local communities have been impacted by agriculture, how tobacco farms have become wineries, and the region's connection to NASCAR. This North Carolina Scenic Byway begins and ends at the intersection of North Bridge Street and Market Street in Historic Downtown Elkin. The Foothills Arts Council is home for the visual and performing arts in the foothills of the Blue Ridge Mountains. The Yadkin Valley Craft Guild represents fine and heritage crafts and craft education in the Greater Yadkin Valley Region. The John Furches Gallery is located at 123 West Main Street in Historic Downtown Elkin. The Yadkin Valley Wine Festival, the largest in state and in the Valley, held annually in May, showcases the region's growing collection of prize-winning vineyards and wineries. The Pumpkin Festival, held in Historic Downtown Elkin on the third Saturday of October, highlights local crafts, arts, music and dance, and of course, who's grown the largest pumpkin! Several local organizations host events throughout the year, including a Fourth of July Children's Parade and a Christmas Parade. For more information on events sponsored by Downtown Elkin, Inc., please visit www.downtownelkin.com. The most wonderful thing about Elkin is not only it’s beauty, but it’s peacefulness of setting, friendly and inviting people and limitless outdoor opportunities. Your quality of life versus the cost of living is definitely tipped toward quality rather than costly; Elkin gives you the freedom to explore the second-you and your second lifestyle! Your neighbors know you and say hello, sidewalks are abundant and walkers even more so. Come for a visit, and why we think Elkin is secret worth telling people about. Elkin is located in the foothills of the Blue Ridge Mountains - just one mile from Interstate 77, 9 miles from US 421 and 18 miles from Interstate 40. It is 25 minutes from the Blue Ridge Parkway, 30 minutes from Virginia and 40 minutes from Winston-Salem.